Avoid the possibility of excess baggage fees from Emirates by shipping your luggage to your destination with Send My Bag. It's the easy way to get a lot of luggage to your destination without having to struggle with several bags throughout your journey. Get your free quote for this cost-effective luggage solution. Economy: one 7 kg (15 lb) bag; 55 x 38 x 20 cm (22 x 15 x 8 in). First and Business: One briefcase; 45 x 35 x 20 cm (8 x 14 x 8 in), plus one handbag; 55 x 38 x 20 cm (22 x 15 x 8 in). OR the handbag can be replaced by a garment bag; max. 20 cm (8 in) thick. No item may exceed 7 kg (15 lbs). Passengers travelling with an infant are allowed one extra item of hand luggage for necessities and baby food. This bag must not exceed 5 kg (11 lbs) or the following dimensions: 55 x 38 x 20 cm (22 x 15 x 8 in). A collapsible stroller or carry cot can also be brought on board, if you are not using a car seat. Musical instruments can be brought on board as hand luggage, or a seat can be purchased for larger instruments. ‘Weight concept’ flights, Economy: 20 kg (44 lbs) – 35 kg (77 lbs), free of charge. Business: 40 kg (88 lbs). First: 50 kg (110 lbs). The weight can be distributed across up to ten bags. Items must not exceed 300 cm (118 in) in total dimensions. On flights to/ from Canada and North America, allowances are based on a ‘piece concept’. Economy passengers are permitted to check two bags up to 23 kg (50 lbs) each, free of charge; First and Business class passengers are allowed two bags up to 32 kg (70 lbs) each. The combined dimensions of both pieces must not exceed 300 cm (118 in). If you wish to purchase additional baggage allowances, substantial fees must be paid. These vary according to route and fare type. On a flight from London to Dubai, for example, an Economy Saver passenger would expect to pay $120 for up to 5 kg over the 30 kg allowance on this flight. Up to 25 kg additional weight would incur a steep charge of $600. 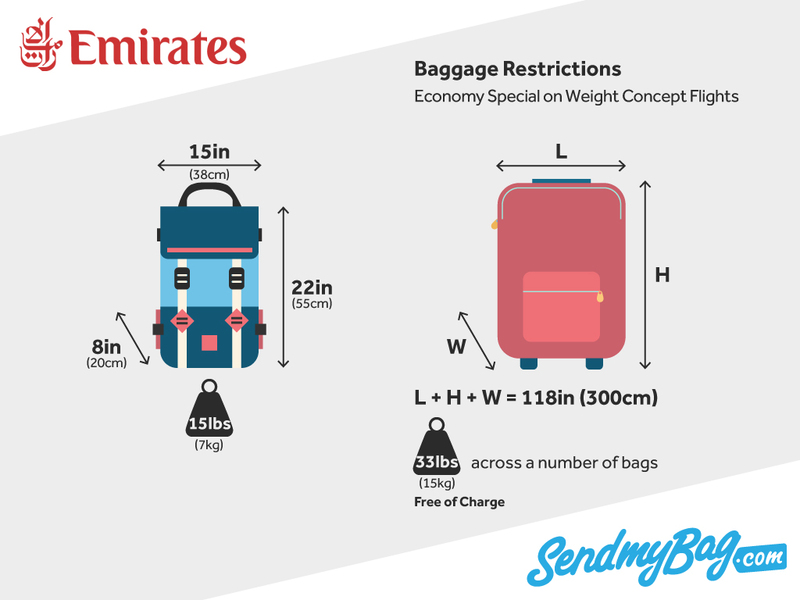 Those travelling with an infant are permitted to check an extra piece of luggage free of charge, as long as it weighs no more than 10 kg (22 lbs), on most Emirates flights, or one bag weighing no more than 23 kg (50 lbs) on flights that operate a 'piece concept'. This piece must not exceed 115 cm (45 in) in total dimensions. A carry-cot or pushchair may also be carried as a carry-on item, or checked, free of charge. Exceptional items such as sports equipment and musical instruments can normally be carried as standard luggage, depending on weight and size. Looking for Emirates sized hand luggage? Based on 38953 independent reviews.